Many travelers consider Vientiane as a stop coming from Thailand or when continuing to Vietnam. Despite this perception, few avenues of Laos’ capital are dotted with different restaurants offering varied international cuisines. Others prefer to stay for few nights in Vientiane to uncover the tourist spots that are distinct from what other Laos provinces offer. With that, limitless options for accommodations are available from hostels, lodging inns, to hotels. 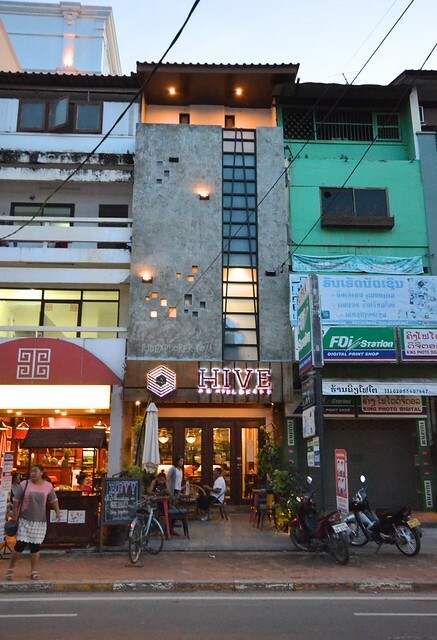 Hive Hostel, along Rue Setthathilath Road, is one of the numerous backpacker dorms in Vientiane preferred by budget travelers. During peak season, because of its vibe and location, the hostel is crowded with travelers around the globe. 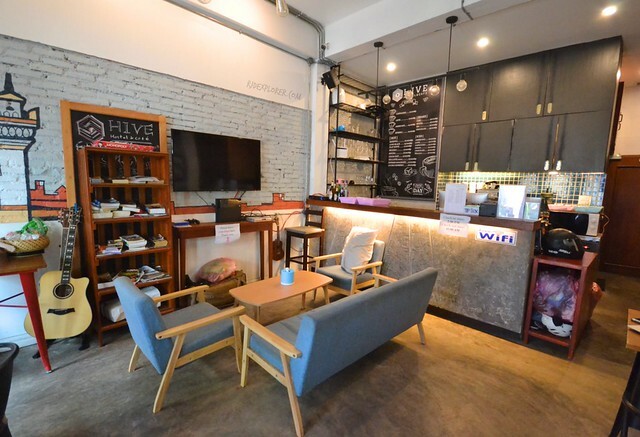 It was low season during my visit but Hive Hostel still offers that happy and cozy atmosphere it provides. All-day coffee and tea, bread, and fruit area. The small facade of the hostel is easy to miss but once you arrive at the hostel’s doorsteps, a refreshing stay will about to happen. Lobby and reception area is on the ground level. Wall arts showing some of Vientiane’s religious and significant landmarks make the vibe more positive. In one corner of the floor is the table for the all-day free coffee, tea, bread, and fruit. 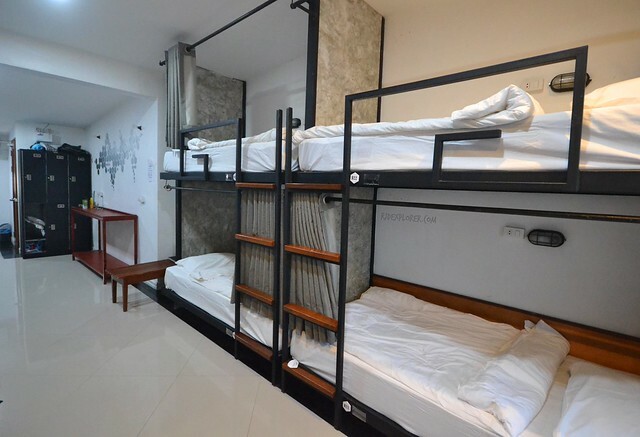 The hostel is not offering private rooms as of the moment and the upper floors of the property are for dorm rooms. They have male, female, and mixed-dorm rooms just in case you have preferences on your stay. The shared room on the topmost floor is a 14-bed dorm. Each bed has a thick curtain that maintains guest’s privacy. Other bed facilities are a reading light, universal plug, and clothes hook. Since Hive Hostel offers separate rooms for male and female guests, they also try to provide separate shower facilities for both genders. Every floor has a bathroom with few shower cubicles and toilets and each is properly labeled if its only for ladies, gents, or both. A towel is provided upon check-in with shampoo and shower gel available on dispensers. The cozy atmosphere of the shared lounge is also offered for walk-in customers on the hostel’s coffee shop. You can avail usual coffee like cappuccino, latte, Americano, espresso, to ristretto, long black, flat white, and mocha. Iced and shakes are also offered by the friendly barista. Common lounge and coffee shop on the ground level. 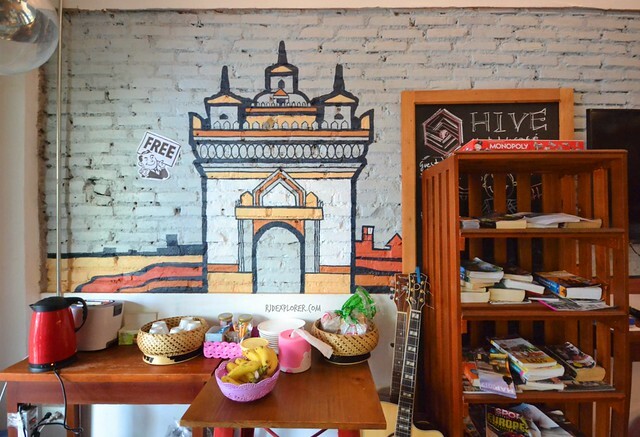 Hive Hostel’s location is accessible to restaurants, convenience stores, and souvenir shops. Few hundred meters away is the night market by the river. If you plan to tour around Vientiane and see some of its handful treasures, you can rent a bicycle from a rental shop on the adjacent street. Bike rent is LAK10,000 (~USD1.2) for an entire day of use. Just bring an identification card as your deposit. Low season is still a nice time to travel to Vientiane, Laos. You can expect lesser tourists on prime tourist destinations and restaurants and cafes are also not crowded. There’s a secret I heard on my stay in Hive Hostel and I wanted to share it with everyone. During peak season, the hostel management offers a tour activity not offered by any accommodation or travel agency in the city. A day trip to Nam Ngum Lake for a fun-filled day at the waters. So when visiting Vientiane in high season, you know the deal!